Purple-haired elven princesses! Yeah! That’s what my life has been missing. Well, no more! I found one, and her name is Nastajia. She lives in Dreamland, which is a place where college student Alex Carter goes every night when he falls asleep. There’s just one problem. He hasn’t gone back since he was 12. The beings of Dreamland thought he was dead. And the place has gone to ruin while he’s been gone. I love swords and sorcery fantasy. I love comics. When writers and artists put the two together successfully, I’m a happy fellow. I discovered this series by accident a couple of days ago at the library. I tracked down the three volumes that currently exist, and read them. I’m glad I did. The Dreamland Chronicles by Scott Christian Sava are a tour de force for the use of computer rendering graphics in comic storytelling. Scott keeps his story fairly simple and direct–just follow Alex Carter, an empty-headed but cute young man, in his travels between Dreamland and Earth. Both places are real, but Dreamland, because it is full of elves, dwarves, giants, dragons, mer-people, and talking animal creatures seems like a fantasy. 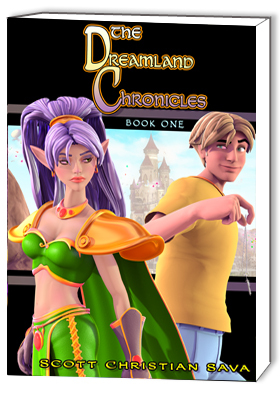 Alex is, of course, a fate-ordained champion for the peoples of Dreamland. 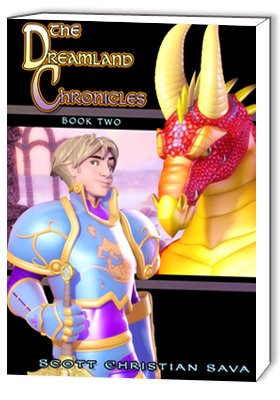 He has to cope with a dragon named Nicodemus, a bad guy who deposed the earlier human king, and who has had things pretty much his own way for the last 600 years. The quest in the story actually belongs to Nastajia, the purple-haired elven queen–everything a fighting elf maiden ought to be. Alex is along in the role of champion, boyfriend, and generally clueless protagonist. 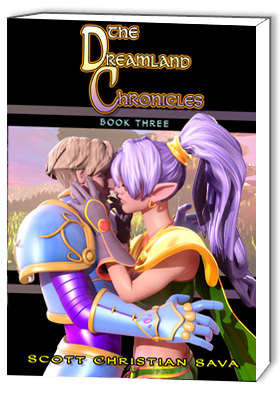 The Dreamland Chronicles aren’t deep, but they sure are pretty. They could serve as every teen’s fantasy of heroic deeds, beautiful babes, and evil foes to vanquish. I don’t think Sava has a message here. He is just indulging his own love for fantasy and pretty art in a long-running project. He has a lot of talented help in the form of computer modelers and artists. And he has a publisher. What more could a budding fantasy writer/artist want? Too bad! Three thick volumes don’t finish the story. I have a feeling we may be in for at least three more, but it is a pretty good-sized chunk of story when taken all together. P.S. A side note: I don’t know what it is about the name Carter and fantasy worlds, but there must be a connection. It is John Carter who finds a bizarre kind of fantasy world on Barsoom–a journey which begins with his astral form shooting off into the void. It is Randolph Carter who is the master explorer of Earth’s Dreamland according to H. P. Lovecraft. Lovecraft’s Dreamland is tied in with the Cthulhu mythos, and is a dark and dreadful place. And here it is Alex Carter who is the favored dreamer in these chronicles. The Carter clan just seem to have the knack for getting away from Mundania.